Horses don't see a child with autism. They see a child. This story is from my new book RIDING HOME - The Power of Horses to Heal and appears in Chapter 8 - "I Wish People Had Ears Like Horses". It is this amazing power of horses to heal and teach us about ourselves that is accessible to everyone and found in the pages this book. When Rachel was seven, her mom, Lynn, took her to three different child therapists for what she called traditional talk therapy. Rachel hated it and, after a while, refused to go. Most of the time, Rachel was simply unable to sit still. Although there are no drugs that can cure autism, Rachel was periodically put on medications -- including Haloperidol, Thioridazine and Fluphenazine (all antipsychotics) and Carbamazepine (an anticonvulsant and mood stabilizer) -- in the hope that one of them might improve some of her everyday functions. Lynn said, "It was like there was something inside her that kept making her move, which she couldn't turn off." The first time Rachel arrived at the horse farm, her equine counselor Sherri led Rachel over to a large gray horse named Alfie. Rachel stopped about two feet in front of Alfie and looked up at his soft, dark eyes gazing down at her. After about a minute, Rachel lifted her hand toward Alfie's nose. Alfie dropped his head and sniffed Rachel's fingers. Rachel quickly pulled her hand away, turned, and walked toward the gate. Alfie followed her. When she got to the gate, she turned back and was amazed to see Alfie standing right behind her. Sherri walked over, looked at Rachel, and said, "Alfie likes you." Rachel's mouth opened in an overwhelming smile. As Lynn told me this, she became emotional and said, "I had never seen Rachel smile like that before in her whole life. She could tell that Alfie was interested in her and that it didn't matter to him that she was autistic." Horses are naturally curious. Their curiosity is often motivated by the possibility of finding something that might feel good, taste good, or be fun to play with. Once they know they are safe from predators or anything that exhibits predatory behavior, their apprehension or fear of any person, place, or object turns into curiosity. Rachel was nonthreatening and had offered her hand to Alfie; he had investigated and smelled it, and then she had simply walked away. Alfie had become curious and followed Rachel. Horses reveal their thoughts and feelings with their body language and behavior. They do not ask, demand, or expect anything from us. They want to feel safe, comfortable, and get along. When Rachel experienced this with Alfie, it was unlike any interaction with another person she had known. Lynn said that Alfie showed Rachel that she could trust him, and if she could trust him, one day she might learn to trust people. As Rachel continued at Good Hope Farms, she started interacting with other girls and their horses. Horses don't see a child with autism. They see a child. Autistic children know this, and it feels good to them. In order for anyone, autistic or otherwise, to grow, heal, and have positive relationships with others, they must first have a positive relationship with themselves. Horses have the ability to make humans feel good about themselves. Autism is now considered the fastest-growing developmental disability in the United States. Some of the most enlightening discoveries about the healing effects horses can have on people with autism are revealed in a book entitled Animals in Translation by Dr. Temple Grandin, a professor in the Department of Animal Sciences at Colorado State University. Dr. Grandin's findings in the field of animal-human relationships are not only remarkable, they're transformative. Some of her most compelling research is found in the similarities between horses and people with autism. It is based on Dr. Grandin's firsthand knowledge, as she herself is autistic. 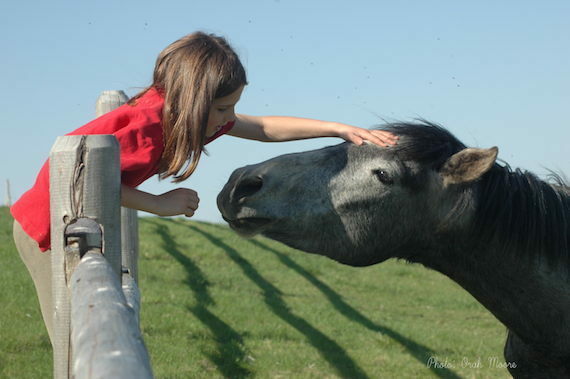 Dr. Grandin reports that there is often a special connection or identification that occurs when an autistic person begins to interact with a horse. She points to a possible basis for this, stating that both horses and autistic people think in pictures, not words or verbal language, and both are hyperspecific. Whether it's a horse or a human, we are both powerfully attracted to that which is most familiar. As with so many other men, women, and children, horses have enabled some of those with autism to become more confident, more trusting, and to feel, even if only for a moment, love for themselves and others. When an autistic child feels the unconditional acceptance from a horse, I believe a small part of their soul is healed.